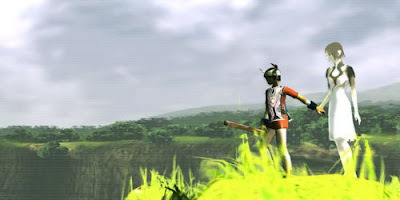 This week's PopMatters post is about some of the brave design choices in Ico. I like playing an old game in the midst of new release season, because it helps put contemporary titles into perspective. Ico came out ten years ago, but many things about it still feel unique. I recently played through Ico again while reviewing The Ico & Shadow of the Colossus Collection and was struck by how risky the game felt in retrospect. I had forgotten how quickly you are thrown into the game. Without any kind of tutorial, the game simply starts and lets the player learn how to navigate through experimentation. The game requires constant action: the lack of automation and quicktime events means you're responsible for making every jump and for helping Yorda over the course of the entire game. In 2001, the move towards more tightly controlled, streamlined experiences was well under way. Today, a game without an explicit tutorial and heavy automation is almost inconceivable. Most games go to great lengths to pursue the player's attention. Flashy special effects, huge set piece moments, and extensive dialogue are standard features in most games, but Ico takes different road. Ico manages to feel large in scope without trading in bombast. Many of its most striking features are tied to its subtlety: the castle's soundtrack consists largely of wind and birds. Creaky machinery and worn stonework quietly tell the story of the game's world. Ico and Yorda's relationship is built up mostly through actions. It shows a lot of faith in the player: instead of being fed a story, you have to look for one and interpret things for yourself. It can be hard to find thoughtful, thematically challenging games outside of the indie scene. Part of this is understandable: if you don't hook a player and keep them hooked, there's nothing stopping them from switching to another game. In some ways, it's very understandable that games assist the player and constantly present them with new stories and plot twists; it's a crowded market and people have plenty of choices when it comes to spending their time and money. Because of this Ico strikes me as a very bold game. It requires more active investment in everything from the jumping dynamics to interpreting the story. It may have paid for its eccentricity during its initial release, but its lasting reputation and subsequent re-release vindicates Team Ico's brave choices.